Solid simulation of the machined manifold layout. CAMTEK Pacific , working with manifold manufacturing companies, has developed Manifold CAM Expert. A hydraulic or pneumatic manifold has to provide control of a multitude of operating units according to the customer specification. As a result, manifolds vary substantially in their configuration and complexity. What is specific about manifolds is that, being very various, they actually consist of standard operating elements representing ideal parametric features. Custom Fluidpower utilises the latest in Cartridge Valve Technology including SUN Hydraulics and Waterman Hydraulics to design and manufacture state of the art hydraulic manifolds covering industrial, mobile, agricultural, marine and aerospace applications. The design is done on Pro-Engineer CAD system using manifold elements as parametric features. Manifold CAM Expert retrieves features data generated during design. For every parametric feature, CAM Expert has rules for its machining, setup by the company's personnel. CAM Expert is using these rules, and Tool-Cut Data Base, to resolve all required machining operations, to produce all features, and to cut the manifold. Preprogrammed manifolds can be loaded onto the machine tool's table or on a multi-sided pallet. 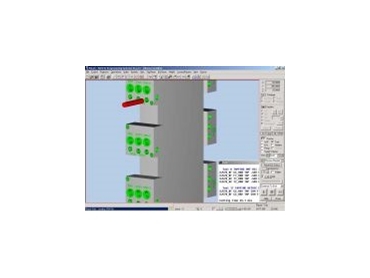 CAM Expert is a process planner which automatically sequencing and grouping all operations for all manifolds in the layout and generates a comprehensive NC machining program for the layout as a whole. The flexibility of CAM Expert allows customising to suit requirements of different manifold manufacturers. Practically any CAD system can be used as soon as parametric features are used and parametric feature data is generated during the design process. Different companies can use different features and different parameters to define them. The machining methods differ substantially between companies as well as cutting tools and cutting parameters. Machining rules of features are compiled by company's personnel using parametric machining operations provided by CAM Expert and conditional control "if - then" if required. Tool-Cut Data Base is modified accordingly to company's piece materials, tooling and cutting parameters. The strategy of the layout machining is changing from one company to another. According to the company requirements some operations can be grouped to be machined with the same tool on all sides to minimise number of tool changes and some can be grouped to machine side by side to provide better precision by minimising number of pallet settings. Custom Fluidpower is using OKUMA machining centre with 100 tools in its automatic tool changer. Practically any machine tool and CNC control can be used, as CAM Expert provides 100% adapted NC output to use all machine tool and NC control capabilities. Camtek Pacific managing director Mark Goldfeld says the main advantage of Manifold CAM Expert is its capability of generating a complete NC program to machine a manifold directly from the design data, practically eliminating human factor. “The reliable NC program, ready to go for unmanned NC machining, is generated in minutes instead of hours. “CAD & CAM go hand-in-hand at last."